TREEOSIX IS THE BONA FIDE PIONEER OF GUIDED, ECO-FRIENDLY ZIPLINE TOURS AND OTHER HIGH FLYIN' ADVENTURES IN THE FORESTS OF SASKATCHEWAN. Summer vacations are about creating memories and enjoying the sunshine. We bring families, friends, and loved ones together through adventure all while having fun, pushing your boundaries, and helping you find your happy dance. At our Elk Ridge Resort location, we offer over 4,000+ linear feet of zip lines through one of the most spectacular forest ecosystems that Saskatchewan has to offer; the boreal forest near Waskesiu Lake. Saskatchewan is our home and also our playground; something we take a lot of pride in. Since opening our doors in 2015, our Elk Ridge basecamp has grown by leaps and bounds to include a 32 foot climbing wall, a 100 foot long pendulum swing, axe throwing lanes, and also mini-zips for kids. Our basecamp boasts a variety of activities for all ages that are purposefully designed to help you connect with nature AND each other. Treeosix is open 7 days a week until the end of September. 9 AM - 4 PM daily. Advanced reservations encouraged. Online booking available. Dial "0" once you arrive at your Elk Ridge Resort accommodation and the concierge will book your tour. 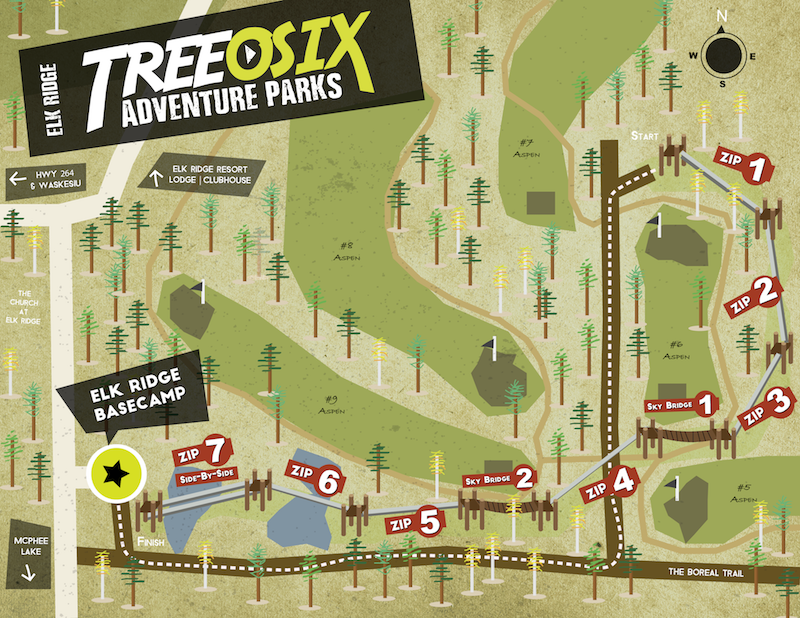 If you are staying off-site, Click Here to visit the Treeosix website.